Hi all, have just come across this forum, my Grandfather George Charles Bramham was a Water SGT with the 247 coy R.A.S.C Motor boats, I have quite a few photos of him with some of his men etc, i will endeavour to post them soon. Many thanks for this and welcome to the forum, be great to see pics of your Grandfather in service there, all the best. 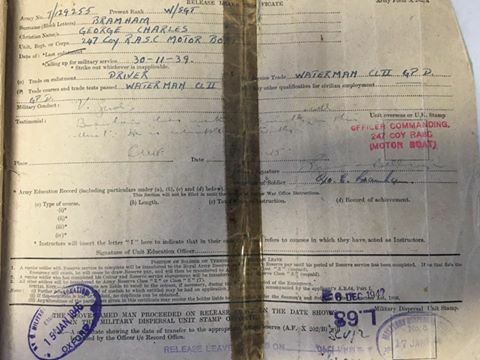 My father also served in 247 Coy and I wondered if anyone could help with a question I have. The War Diary entry for 24th April 1944 reads “Cutters H268 & H269 on passage from Torre del Greco to Reggio machine-gunned whilst crossing Salerno Bay by American Air Force. No damage or casualties!” I have tried to find more info or pictures of H268 or H269 with no luck and I wondered if anyone could help. I also have some pics of water transport and people (unidentified) which I could post (when I find out how to attach an image...) if anyone is interested. 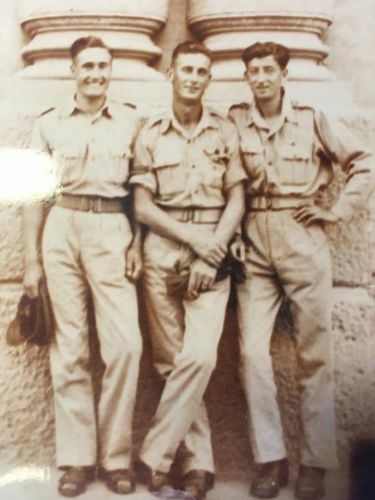 Hi all i too seem to be having trouble uploading images, my grandfather George Bramham water sargeant 247 coy is on left of pic facing one of his men, not sure who other men are or where pic was taken if going off the writing behind them on the wall could well be France? I can’t help with the picture location and others with more knowledge/experience may contradict me, but from the War Diaries (available in the National Archive in Kew) this company was operational in Sicily and Italy. 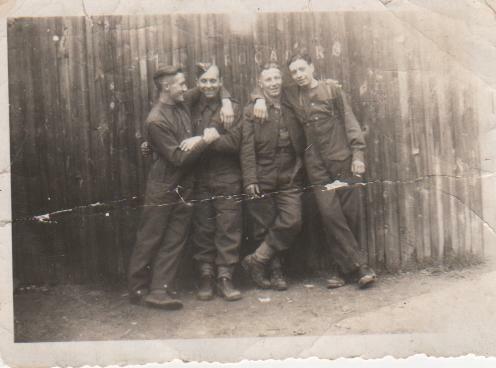 My father was posted to 247Coy in January 1944 and I have a few pictures of him (unusually, with annotations on the reverse!) in both of these places. Whether 247 was in France until the Dunkirk evacuation I don’t know, but you may get more info if you post this on the “WW2 Talk” website. 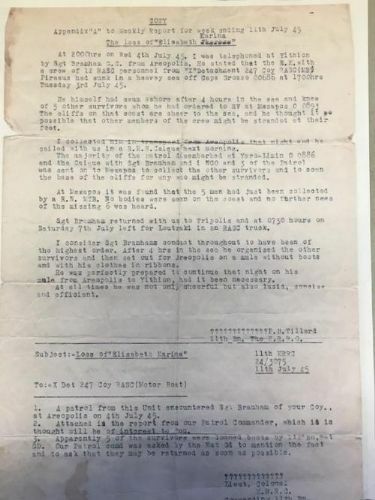 I have a number of pics of War Diary entries showing the various reports and witness statements, including one from your grandfather, on this incident. The documents suggest that this ship was carrying supplies from Piraeus to Kalamata and was lost in heavy seas. Do you have the entire diary, or would you like me to send the pics I have? If so, send me a private message with your email and I’ll gladly forward them. "Born 22nd June 1917. He attended Greaves Central School before entering LRGS on 29th September 1928. On his record card his father is stated to be an upholsterer, and his address was 11, Gloucester Avenue, Bowerham. He left LRGS on 28th January 1936 when in Form VI Modern, and went to ‘Foreign Office/Williamsons’, which you will have to interpret as best you can. In the Old Lancastrian’s Newsletter of May 1945 he wrote that he had been serving in Motor Boats in the Mediterranean for two years, which begs the question whether he would still have been there in July when the war in Europe was officially over. As for the prize, it was instituted in memory of him by his parents, is the Lower VI Form French prize, and survives to this day. It would be interesting to learn of the circumstances of his death, but I don’t suppose we will ever know." Burrough served in 247 Company (Water Transport) RASC, he died on 3 July 1945...any help gratefully received!